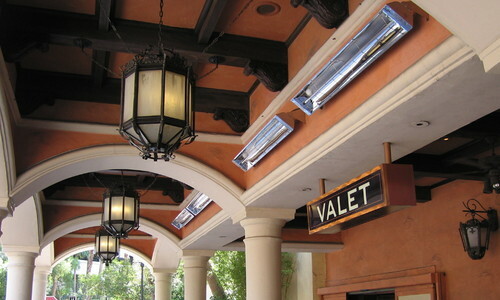 Patio heaters are common in a residential setting, but heaters are much more commonly found in commercial environments. Commercial heaters range widely in their design, BTU output, fuel type, intended use, and heating technology. Commercial patio heaters that are commonly used in restaurants and other businesses in the hospitality industry, are nearly identical to residential patio heaters. While some industrial strength heaters used in factories can be as large as a car, and unrecognizable next to their small consumer cousins. While the name “heater” is pretty self-explanatory, quite simply put… they heat things! Their designs, how much heat they make, what fuel they use, and their intended uses are where their differences lie. Comfort heating is the more common and recognizable heaters, whereas industrial heaters are only found in factories or other manufacturing settings. Comfort heating is widely used in residential and commercial applications. With the variety of indoor & outdoor commercial heaters available, any business owner can easily heat their patios. Heaters can be installed into your walls or ceiling as permanent installations, or you can have the flexibility of portable heaters. Many businesses use portable and/or permanent heaters to keep their outdoor patios warm for their residents or customers. The purpose of these types of heaters are simply to keep outdoor areas or indoor spaces warm, and if they are warmed to a comfortable temperature, these areas stay usable for longer. Industrial heaters are used in chemical laboratories, packaging plants, and many other production industries. Some of these heaters are very specialized. They also range greatly in size and their use. Some are small and portable, others large enough to fit a vehicle inside. Industrial heaters are built into assembly lines to produce countless products that are often taken for granted. They can be made to emit long, near, or medium wave infrared; depending on their application. Without many different types of infrared heaters, we wouldn’t be able to produce many everyday items, such as: semiconductors, electrical cords, anything made of plastic, advanced pharmaceuticals, batteries, and refined oil & gas - to name just a few. While we’re thankful for the heaters used in the industrial sector, we only sell comfort heaters at AEI. Most heaters made for space heating are going to use infrared technology to generate their heat. This is because infrared rays are much more effective at heating people and objects in an open area when compared to traditional convection heaters. Convection heaters are effective in an enclosed environment like an indoor fireplace. Convection heaters heat the surrounding air, which circulates throughout the area until all the air has been warmed. If you have a large space to heat, or it has any airflow; the warm air will be blown away. Convection heaters like a fireplace or a traditional outdoor campfire require lots of fuel and effort to keep going. Infrared heaters emit rays of energy(just like the sun) that heat any solid object they touch, not the air they pass through. This distinction makes infrared heaters effective even in exposed conditions. Our infrared heaters used for comfort heating emit medium length infrared waves, which warm us as they are safely absorbed by our skin. The way infrared space heaters work is by heating a material(infrared element) that safely emits infrared waves when it gets hot. The element can be made of quartz, ceramic, stainless steel, or other metals; and is shaped as needed, usually as a rod or emitter grid. The infrared element is usually heated by electricity, propane, or natural gas; each fuel source causes the element to emit infrared rays that safely warm people and objects. Heaters that use natural gas(NG) or liquid propane(LP) as their energy source make excellent infrared heaters and are in use all around the world. Whether they are burning gas or propane to heat the infrared element, the warmth they generate is from infrared rays. We usually carry both natural gas and propane versions of each gas patio heater model. This gives our customers the flexibility to choose the model that’s right for their business, without compromising their desired fuel source. Heaters that are made to run on natural gas are exceptionally convenient because they are usually installed in place, take up less floor space, and they tie directly to your or property’s gas line. The cost of running these heaters is paid in your gas utility bill. There is no need to change out a tank of fuel because it is always connected to the gas line. Since gas heaters are free of having to house a large fuel tank, they can be inconspicuously mounted to the floor or completely out of the way by hanging from the ceiling/rafters. Infrared heaters that are made to run on liquid propane are comparable in cost to NG heaters, and also very easy to operate. The biggest benefit of most propane heaters, is they are mobile. With an encased fuel supply and wheels, you can quickly and easily move them to where they are needed. They can be positioned and turned on when they are needed, and they mobile propane heaters can reach outdoor areas where permanent heaters can’t be installed. Liquid propane is readily available at many gas stations and businesses throughout the country. There are also services that deliver filled propane tanks regularly, as a service. Portable propane tanks can also be rented for one-time events or parties; from various party supply companies. Changing a propane tank is very easy to do if you follow instructions properly. The propane tanks are housed at the base of the heaters and are covered by a fitted metal casing, which blends nicely with any surrounding decor. Electric infrared heaters are very efficient, and cost effective patio heaters. Once they are installed, operating them is incredibly straightforward. The infrared element is heated by coiling a conductive wire around the ends of the element and then charging that wire with electricity. This causes the quartz element to generate infrared waves that quickly warm the area. Using electric infrared heaters will increase your electric bill, but the costs should be minimal compared to other types of fuel sources. There are different uses for commercial heating in many different industries. The vast majority of comfort heating is needed in hospitality sectors. Here are some of the types of businesses that utilize comfort heating the most. 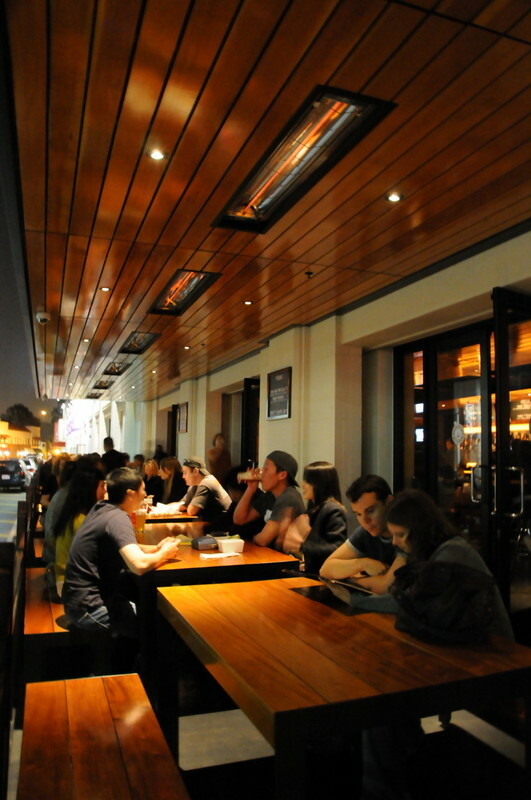 Restaurants with outdoor patio areas rely heavily on patio heaters to keep the customers happy. Having a patio helps draw crowds, and increases the maximum number of customers you can service at one time. Installing or deploying portable heaters can keep your outdoor areas functional for longer into the night- for the whole year! Resorts and hotels can increase their appeal to visitors by having outdoor amenities available. Pools and BBQs are just two examples. 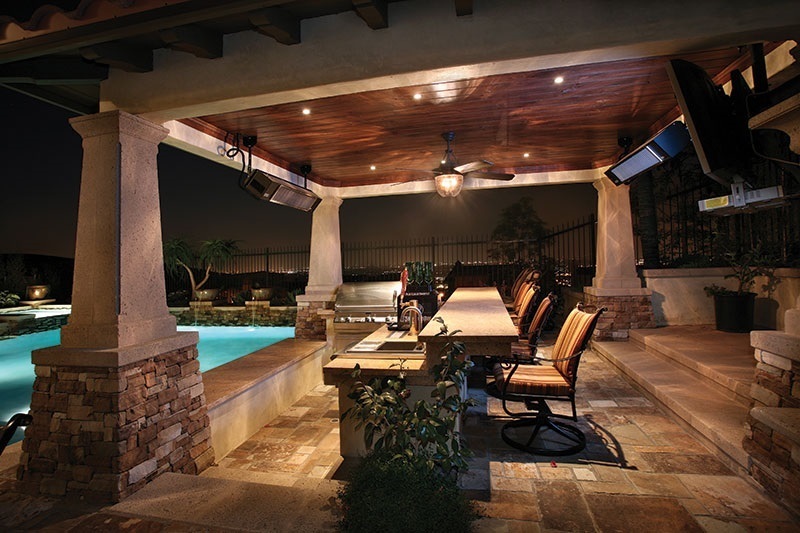 Having patio heaters available means that guests will be able to stay warm while using your outdoor amenities. Similarly, condominiums and apartment complexes often increase install community amenities for their residents to enjoy. Depending on a variety of factors, a company can install or supply heaters for events and/or for their guests to have while using outdoor amenities. Some companies that rent out party supplies for events, weddings, birthdays, and parties (supplies like: tables, chairs, dishes, etc) can also offer portable heaters to their customers. Renting a portable propane heater can be a lifesaver for many outdoor events. A rental company can make their investment back, and their customers get the benefit of a commercial infrared heater for their party or event. Religious institutions often have gatherings of various sizes. Some indoor, and some outdoor. A church could benefit from owning their own portable heaters or installing permanent heaters for their members to stay comfortable. Schools that have outdoor eating areas, or need heat on demand for their events can buy their commercial heating systems. Infrared heaters used for comfort, are nearly identical whether they are made for residential or commercial use. That is because they are doing the same thing, safely heating things (usually people) from a distance. Usually in an outdoor patio-like setting or a semi-enclosed indoor area. Heaters in the manufacturing and other industrial sectors can vary widely and are usually never seen by the average person. Heaters are always going to be a big part of our lives.